Hard to find anything more rustic than this. 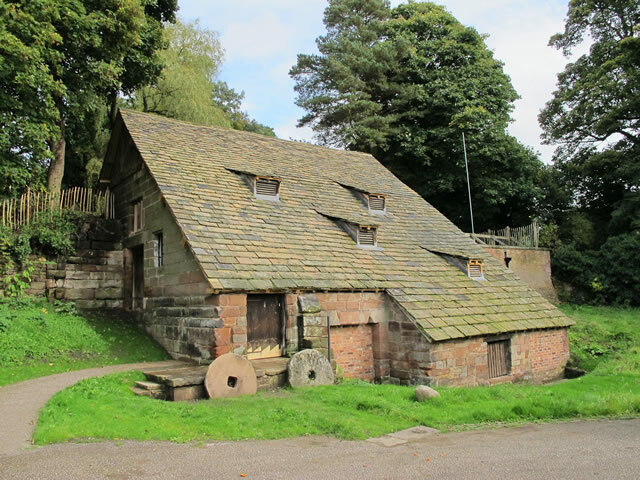 Nether Alderley Mill is living history, a working corn mill that gives insight into how people lived for centuries. The mill is constructed in buff-pink ashlar sandstone, and has a long cat-slide roof of Kerridge stone-slate. Its plan is rectangular. The roof weighs about 200 tons, and is carried in an Elizabethan oak frame. The rear wall of the mill forms the dam for the lake supplying the water for the mill; this also acts as a moat for Alderley Old Hall. The water drives two overshot wheels of 12 feet (4 m) and 13 feet (4 m) diameter. Each operates separately, forming in effect two distinct mills with its own machinery, the water passing from the upper wheel to the lower one. The earliest reference to the mill is in 1290. The present mill was the manorial mill of the Stanley family. Between 1595 and 1597 the mill was completely rebuilt, although it was a smaller building than that of today, some of its stone work can still be seen in the basement. Down in the mill tunnels the date 1746 is carved into stonework, the date we believe the mill was enlarged to its current size and layout. To save on cost the builder used salvaged materials from the earlier building - stonework and roof timbers all show evidence of having been re-used. This new mill needed more power so the millpond and tunnels were built at the same time. In 1787 new plans of the village were drawn, showing the drying kiln for the first time. In the early 1800s a new upper waterwheel and cast-iron mechanism were added. In the 1840s a new lower waterwheel was added and new tunnels cut under the mill to take away water more efficiently. In the 1870s a new cast-iron hurst frame was installed as well as the gearing to connect it to the upper waterwheel. The miller worked long days, from dawn until dusk. He began his day by hoisting the many sacks of grain, one at a time, onto the millstone floor above him using the sack hoist. This was back-breaking work. Throughout the day he had to keep the hopper full to make sure the millstones didn’t run dry, and check the bags weren’t overflowing. If the stones ran dry they would become damaged, but it was also dangerous as flour dust is highly flammable and if a spark is created from the dry millstones this will start a fire. By the end of the day, the miller would be covered in flour and had to spend time clearing up. The miller would also check over all of the mill machinery and make any repairs before the next days work. All this hard work impacted on their health and they often developed nasty coughs from inhaling flour dust all day. One of the last millers, John Hogg Rawlins died from congestion in the lungs. The miller would test the flour between his thumb and forefinger. If the flour felt smooth and not greasy or rough he knew that all was well. If the millstones were set too closely, the flour would feel greasy as it was too bruised and wouldn’t rise well. The daughter of the last miller describes helping her uncle, Ernest Rawlins, at the mill when she was a little girl. She remembers testing the flour, describing it as feeling like ‘warm silk’. The machinery at Nether Alderley Mill is over 100 years old, with some parts dated to 1871. 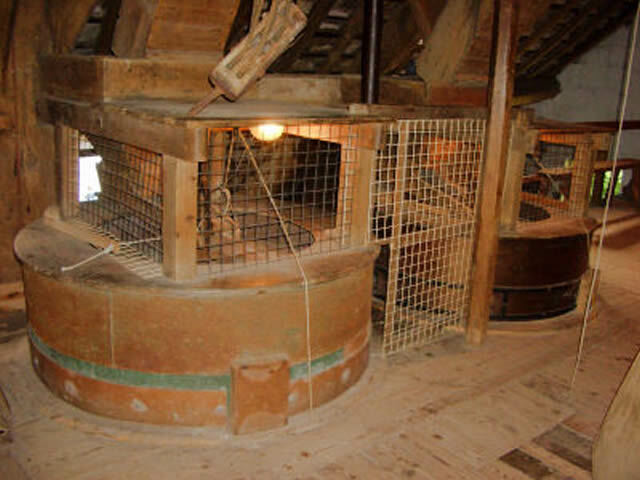 The original Elizabethan machinery was made entirely of wood and had long worn out and been replaced. The mill transformed grain into flour for the village. The start of the transformation.Grain was bagged up in the kiln and moved by the sack hoist to the upper floor. Here it was emptied into the hopper and flowed down onto a shallow trough, known as the shoe, and shaken by a four-pronged spindle (the chattering damsel) to allow the grain to flow evenly. Grain entered the centre of the millstones and was ground between them, emerging as flour at the edges before falling to the floor below through a second chute. Here it entered a sifter that separated it into three types of flour: fine, sharps and husks. Each type was bagged at the bottom of its chute. Although the water systems and milling mechanisms are complex they do follow a logical sequence, with water entering the mill to power the water wheels that, in turn, drive the systems that turn the millstones, sack hoists and flour sifters. Managing the water and grain supplies, as well as knowing how to make running repairs or bring in the right help from millwrights, blacksmiths, carpenters or stone cutters, were crucial parts of the miller’s job. Before milling could start it was important that everything was in working order. This included the grain, which was dried in the kiln to stop it from going mouldy once ground. The milling mechanism dates from the 1800s and is mainly made of cast-iron. Until it was possible to produce cheap cast-iron, machinery like this was made entirely of fruit wood such as apple or pear, which limited the size and, therefore, the power available. Perhaps the most important parts of the process are the millstones, each of which weigh over a ton. The bottom millstone is known as the bedstone and is fixed to the floor whilst the top millstone, the runner, spins above. Access is by guided tour only. Designated disabled parking space. Access to the upper floor of Nether Alderley Mill is limited. There is a virtual tour including a photograph album on the ground floor. There are steps and uneven terrain, thus wheelchair access is limited. The tour guide will describe artefacts for the visually impaired. There are no toilets. Transport: Alderley Edge (National Rail). Bus route Sapphire 130 stops outside.